Attending Legaltech 2018 in New York? Be sure to visit Zapproved at Booth 1400! Say hello and learn about our unique litigation response software specifically designed for corporate e-discovery professionals. While you’re at our booth, test your litigation response skills by taking the E-Discovery Challenge. The adrenaline-filled 5 minutes lets you quickly and easily search, cull, review and hold e-discovery data with Zapproved’s software. See how effortless this process can be with our intuitive tools. Winners score, so don’t miss out. 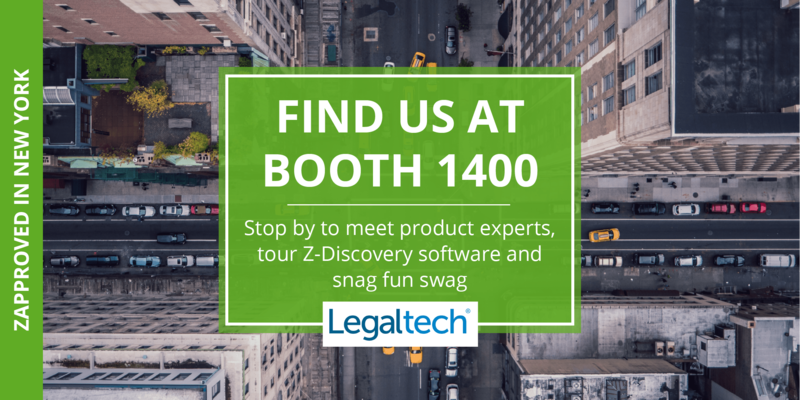 Jan. 30 – Feb. 1, 2018, 10 a.m. – 5 p.m.
Stop by to meet product experts, tour Z-Discovery software and snag fun swag.